You can turn on a daily email that will tell you who is out of the office today and tomorrow and also a Slack integration which will send these notifications to a Slack channel of your choice. Staff Squared will send you daily email reminders about who is out of the office today and tomorrow. It can also send a notification about who's out of office to one of your Slack channels. Navigate to your company settings. Click on the Reminders tab. You can then choose to send daily "who's out?" email and the time this should be sent and who should receive it, decide whether to send this even if there is nobody out and integrate your account with Slack to receive the notifications in a Slack channel. 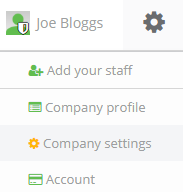 NB: The notifications can be turned off for the whole company but not individual accounts. Please also be aware that your timezone settings will affect the time this is received. If an individual profile time zone is set differently to the office timezone, staff will receive the notification according to their profile settings.